The never-ending demand for Pacific bluefin tuna among sushi lovers is driving the iconic fish towards extinction, a conservation group said. The Swiss-based International Union for Conservation of Nature upgraded the status of the tuna from "least concern" to "vulnerable," which means it is now threatened with extinction. Target by the fishing industry for the sushi and sashimi markets in Japan and other parts of Asia, an increasing number of the fish are caught as juveniles which has caused its population to drop as much as 33 percent in the past two decades. "The Pacific Bluefin Tuna market value continues to rise," said Bruce Collette, Chair, IUCN Species Survival Commission Tuna and Billfish Specialist Group. "Unless fisheries implement the conservation and management measures developed for the Western and Central Pacific Ocean, including a reduction in the catches of juvenile fish, we cannot expect its status to improve in the short term." The dire assessment for the Pacific bluefin comes as environmentalists warned that increased quotas approved Monday for another bluefin species, the Atlantic bluefin, could cause that population to crash. Pacific bluefin was joined on the IUCN's Red List of Threatened Species by the Chinese Pufferfish, American Eel and the Chinese Cobra whose downfall were all blamed on the loss of habitat due increased fishing, logging and mining. "Each update of the IUCN Red List makes us realize that our planet is constantly losing its incredible diversity of life, largely due to our destructive actions to satisfy our growing appetite for resources," said IUCN Director General Julia Marton-Lefèvre. The list assesses 76,199 species; of those, 22,413 are threatened with extinction. Nearly half of the newly assessed species occur within protected areas, raising concerns about how these areas are managed. Japan has long been the driver of the bluefin's demise, since it imports more than 80 percent of the raw tuna for traditional dishes such as sushi and sashimi. The bluefin variety -- called "hon-maguro" in Japanese -- is particularly prized, with a 200-kilogram (440-pound) Pacific bluefin tuna fetching a record $1.76 million in 2013. The Pacific bluefin is just one of several species caught for fish markets in Japan. Until recently, conservationists thought the Pacific bluefin was doing much better than the Atlantic bluefin which was the focus of a U.S.-backed proposal to ban its export back in 2010. 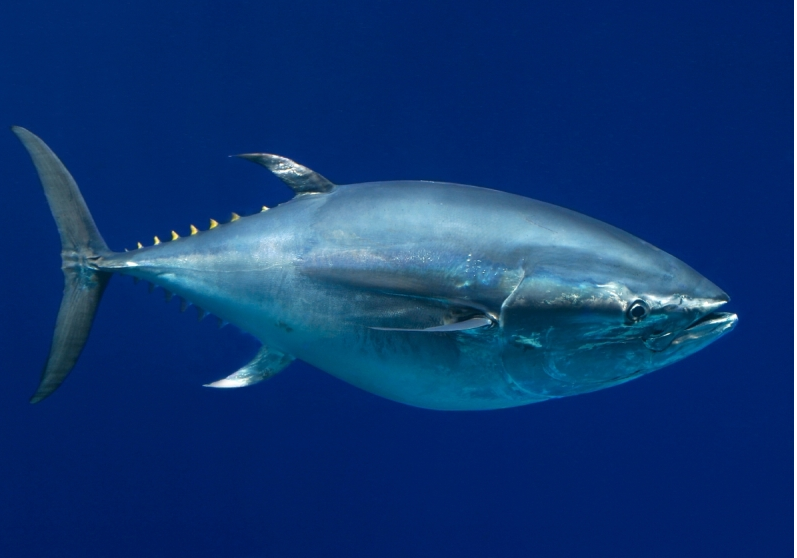 The Japanese successfully argued the ban on Atlantic bluefin would devastate the economies of poorer nations. Instead, it called for the fish to be managed through quotas set by international fishing bodies. As a result, the International Commission for the Conservation of Atlantic Tunas in 2010 cut the annual global quota by 40 percent eastern Atlantic Bluefin to 14,900 tons (13,500 metric tons) and reduced it to 14,200 tons (12,900 metric tons) a year later. There has also been increased enforcement to help reduce illegal fishing -- though it remains a problem -- and growth of farm-bred tuna in Japan has helped meet the demand. But in the past two years, quotas have started to rise again, threatening what conservationists said were gains in the populations. They were increased slightly in 2013 and 2014 to 14,900 tons (13,500 metric tons) and on Monday the 50 countries in ICCAT voted to increase those quotas by 20 percent from 2015 to 2017. "Despite the last few years of progress from ICCAT countries, the decisions this year have shown that this Commission is not accounting for critical vulnerabilities highlighted by science," Paulus Tak, a senior officer with The Pew Charitable Trusts, one of the environmental groups that monitors tuna populations. "Instead of continuing progress toward adopting precautionary, science-based catch limits in some of these fisheries, member countries put in place very risky quotas that could lead to declines in bluefin populations."